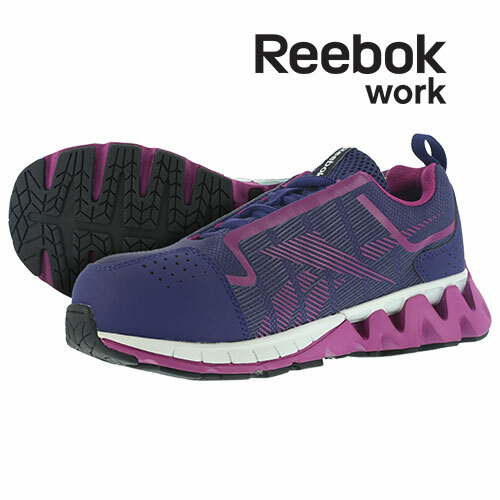 Reebok brings their world-famous athletic shoe innovation, comfort and quality to the work shoe market! Reebok is a recognized leader in superior footwear design. Now, you can enjoy their legendary performance in this attractive work shoe! These ASTM F2413 compliant women's work shoes feature a carbon toe for safety, a 100% non-metallic design and a rubber dual resistor outsole for static reduction. This ZigWild athletic oxford styling also features micro-mesh uppers, moisture wicking nylon mesh lining, removable FootFuel shock-absorbing insole, rigid TPU heel stabilizer, ZigTech dual density EVA outsole with rigid heel stabilizer and an extra wide toe box. Color: Purple/pink. Womens size 8W.